Arizona State Parks and Trails standard or premium passes are no longer accepted at Boyce Thompson Arboretum. Boyce Thompson Arboretum State Park is the place to discover the intricate beauty and many faces of Arizona's oldest and largest botanical garden. Featured are plants from the world's deserts, towering trees, captivating cacti, sheer mountain cliffs, a streamside forest, panoramic vistas, many natural habitats with varied wildlife, a desert lake, a hidden canyon, specialty gardens and more. This season the park will host additional Girl Scout badge workshops, offering girls a chance to study subjects ranging from photography to desert critters, wildlife and even finding your way in the outdoors. Includes a non-refundable down payment of $20, and is required to hold a position for a scout or troop. Workshop/Admission Fees: $10 per scout, $10 per adult, $5 per non-scout age 5-12. 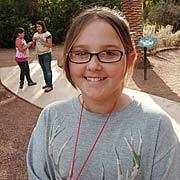 To sign up and prepay, have a credit card ready and call Arboretum staff at 520-689-2723. Deadline to pre-register is two business days prior to the workshop date. When calling about Girl Scout workshops, please be ready to tell staff the specific workshop and date you wish to register for, your Girl Scout troop number, your name (or the troop leader's name); contact phone numbers, the number of scouts and chaperones attending, and provide a credit card. Girl Scout leaders or parents who want more information are invited to email Lacey Pacheco at [email protected] to be added to Lacey's email alert list for scout troops, parents and educators (or call 520-689-2723). 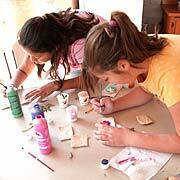 Learn more about Arizona Girl Scouts from the Arizona Cactus-Pine Girl Scout Council and the Sahuaro Girl Scout Council. Teachers and parents: our goal is that you consider the Arboretum an extension of your class rather than just a day-trip destination for the students. Our guided tours are targeted to meet a range of Arizona statewide academic standards, and we want to hear from educators as we continue to develop and improve our new school outreach program. Review the guided tours we offer below and request one by email to Education Coordinator Lacey Pacheco [email protected], or call Lacey at 520.689.2723. We offer a wide range of tours throughout the year including once-a-month tours interpreting Edible/Medicinal Desert Plants, also Plants of the Bible Land. During summertime months we offer "Learn Your Lizards" guided walking tours, guided butterfly and dragonfly walks. More detail can be found on the BTA events page. In this age of accountability, a teacher's ability to take their class on field trips is greatly limited. The Arboretum is far more than a destination for your students: our goal is to be an extension of your class. And we invite homeschool families to gather for our guided tours during Homeschool Days, which are offered four times each year (more information at the end of this page). How tall does a Saguaro cactus grow? When do their arms begin to appear? If you're lost in the desert can you really drink water from a barrel cactus? What kind of bird made that nest? Thousands of students from Maricopa, Pinal and Gila county schools visit the Arboretum each year, and our volunteer tourguides have plenty of practice answering questions like these. Classes from public and private schools - and homeschoolers, too - visit the arboretum nearly every week to enjoy a guided tour of the grounds and lessons in desert ecology from our knowledgeable docents and staff. Teachers: don't miss the opportunity to bring your class for a guided tour. To request one, review the tours below and email your request to Education Coordinator, Lacey Pacheco, [email protected], or call Lacey at 520.689.2723. Education is our highest priority, and fees are reduced from $2-$4 per student for groups of at least 15 youths who are affiliated with a public or private school (homeschoolers please see Homeschool Days schedule below). Guided tours must be pre-arranged with at least four weeks' notice ahead of the requested tour date. School groups typically arrive between 9-10 a.m. for a tour that lasts about two hours and ends up in the picnic area for lunch. 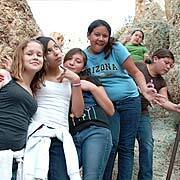 All of our theme tours are aligned with Arizona Department of Education Standards. Themes and grade levels for the coming year include: The Arizona Tour for grades 3-8, The Tree Tour (grades 3-8), Deserts of the World ( grades 7-12), Plants of the Bible Land (for any grade level, and adult tour groups as well). 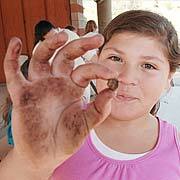 Teaches Arizona ecology and habitat, Arizona's common plants, state symbols, and the geology that has shaped our state. Students learn about the various deserts of the world, weather patterns and landforms that create these desert conditions and how plants, animals, and people have adapted to life in the desert. Students will learn about the processes trees use to sustain life, be able to identify trees common to central and southern Arizona, discuss the interdependence between trees and people, and receive an introduction to "Treeometry." Did you know that the Sinai Desert lies roughly at the same latitude as our own Sonoran Desert? For this reason, it is not surprising that many of the same plants common in the Middle East thrive right here at Boyce Thompson Arboretum. Join an Arboretum volunteer on a guided tour to learn about palms, pomegranates, figs, olives, and other plants of the Bible Land. Wear comfortable walking shoes and a hat, and don't forget your sunscreen and water bottle. The tour, conducted at a leisurely pace, lasts about 90 minutes and proceeds along wheelchair-accessible paths. 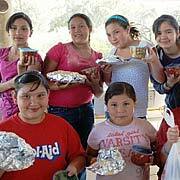 Using references in ancient texts, guides will describe how people of the Bible Land used plants as food, medicine, and shelter in ways similar to how native peoples of Southern Arizona continue to do so in modern times. Opinions and views expressed by volunteers are strictly their own and do not necessarily represent the position of the Boyce Thompson Arboretum or its management. Read more about our Plants of the Bible Land Guided Tour. These self-guided tours offer opportunities for specialized classes to practice their specialty in a natural setting. For foreign language classes, the arboretum has printed trail guides available in Japanese, Spanish, German, and French. Our beautiful grounds are ideal for art and photography. Be sure to bring plenty of adult chaperones. Boyce Thompson Arboretum State Park is the place to discover the intricate beauty and many faces of Arizona. Encompassing 323 acres, the Arboretum is Arizona's oldest and largest botanical garden. Featured are plants from the world's deserts, towering trees, captivating cacti, sheer mountain cliffs, a streamside forest, panoramic vistas, many natural habitats with varied wildlife, a desert lake, a hidden canyon, specialty gardens and more. The Arboretum was founded in the 1920s by mining magnate Col. William Boyce Thompson. In 1917, Col. Thompson served as co-leader of a Red Cross mercy mission to Russia, where he came to understand the importance of plants as the ultimate source of a large portion of mankind's food, clothing, and shelter. It was then that he determined to use his great wealth to improve the use of plant resources. The Arboretum is one of his legacies.